We've had a response from Royal Mail about the Cylinders used on the Battersea issue, and have amended the original message here. As announced on our website, we will be undertaking some technical changes this weekend involving moving servers. There will almost certainly be an interruption in service on our e-commerce site (www.norphil.co.uk/catalog). 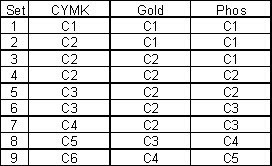 Update: although the e-commerce site is visible, the search facilities, the country-drop-down and some other aspects are broken: actual products cannot be seen this way. They can be seen by clicking on "What's New". Later Update: we believe the broken aspects are now fixed - those that we have tested are. If you find something wrong, please do tell us. We'll have all sections back to normal as soon as we can and apologise for any inconvenience. Royal Mail and Pink Floyd have teamed up to produce a unique souvenir stamp product featuring the band’s final studio album, The Division Bell (which featured David Gilmour, Nick Mason and Richard Wright), issued tomorrow Saturday March 6. 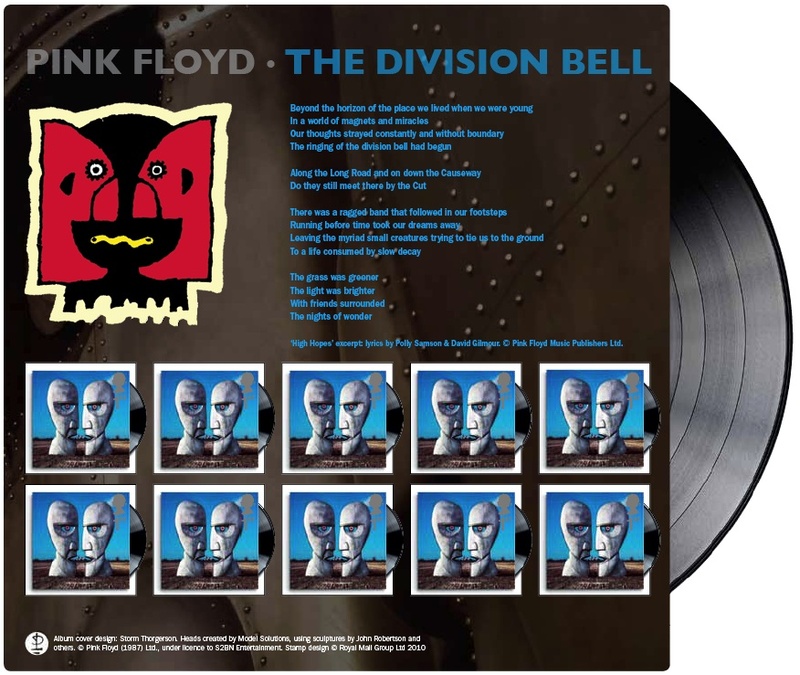 Issued on guitarist and vocalist David Gilmour’s birthday, the sheet’s design mimics a 7” record cover and features ten of the 1st Class The Division Bell stamps, first released as part of Royal Mail’s hugely successful Album Covers issue of January. The sheet also features the lyrics of ‘High Hopes’, the final song on the band’s final studio album, along with a Pink Floyd emblem against a background of the astonishing metal heads which featured on the record’s cover. And to celebrate the stamp sheet, fans can watch the band playing the song on Pink Floyd’s official website. Since its release in 1994, The Division Bell has sold more than 12 million copies worldwide, and the sheet is issued as part of Royal Mail’s Big Month of Music which runs throughout March 2010. 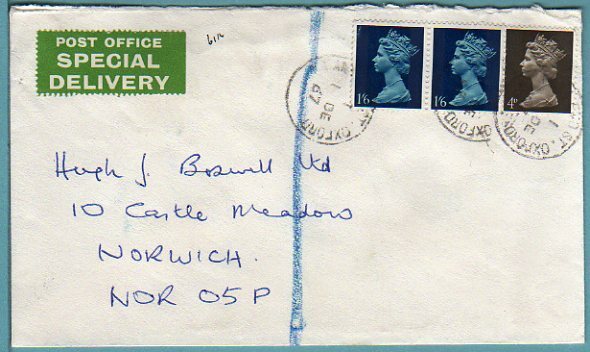 The Sheet will be available to order from Royal Mail online and from their Philatelic Bureau but not apparently from Post Offices. 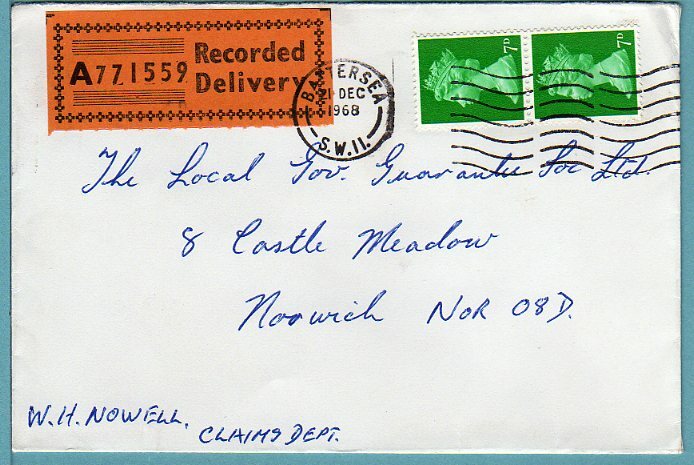 Priced at 85p over face value, it is unlikely to appear in standard stamp catalogues. These sheets were delivered to us on Friday 12th March, a week after the official 'issue' date.